So very often these days, there is little or nothing to get excited about in the world of new retail developments. Coal Drops Yard in the Argent-developed King’s Cross area of London is different though, very different, and that’s largely thanks to having drafted in Heatherwick Studio to convert two old, long, thin, Victorian industrial buildings into a retail destination. Heatherwick Studio is inextricably linked with King’s Cross. The studio was set up 24 years ago in the area, the eponymous founder has lived there for 17 years and now it has this, its biggest project to date in the UK, opening in the very same part of London. And that’s without mentioning the fact that the studio is also in the process of creating the Google UK HQ with Bjarke Ingels Group, just a few metres away from Coal Drops. The two long brick buildings are oft referred to by the studio as being like Kit-Kats — that’s two enormous Kit-Kat fingers, which have been broken apart and laid back down at an angle to each other. 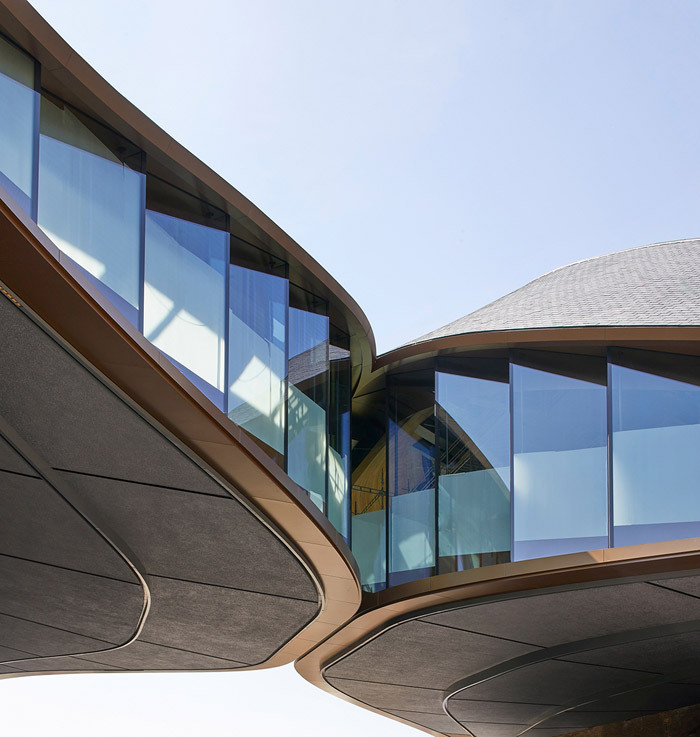 The studio was originally tasked with putting in bridges to connect them, but has instead chosen to have the two slate roofs lifting up and meeting where the fingers come closer together. It’s as though a giant has come along and lifted up the roofs to see what was inside and then imperfectly put them back down so that they kiss and support each other in mid-air. It’s at once dramatic and, for all the complexity and massive amount of steel work involved, really rather subtle and elegant, not to mention unexpected and engaging. Where the roofs lift up and join, an enclosed space — a very unusually shaped enclosed space — is formed and that will open to the public next year, while the rest of the retail, which faces into the central space created by the splayed fingers, opened at the end of October. Coal Drops Yard used to do what it says on the tin. Coal mined in the north of England would be transported by train to these sheds and offloaded straight from the trains into hoppers below, and then dropped onto carts where it would be bagged before being sent out to be poured down the waiting cast-iron coal-holes of London homes. Heatherwick Studio works well with heritage buildings vis-a-vis the Bombay Sapphire distillery (2014) in an old paper mill in Hampshire and the Blueprint Award-winning Zeitz MOCAA gallery (2017) in Cape Town. The studio seems to delight in the nature of the buildings themselves and the design narrative they offer. The studio has also done retail before, in particular Pacific Place in ‘shiny, blue-skied, shoulder-padded Hong Kong’ as Thomas Heatherwick himself describes it. This project completed in 2011 involved bringing a tired Eighties shopping mall into the 21st century. Heatherwick says the studio learned a lot from the development including that the ideal maximum separation in retail is 13m, while at Coal Drops the buildings are 26m apart at the closest point in the north and 39m apart at the southern end. So, a huge amount of work went into finding out how to bring the two together, resulting in the defining kissing. Other elements from Pacific Place are brought to play here as well, including literal touchpoints such as strange and individually designed lift buttons that will age with the patina created by use. It’s the kind of attention to detail and crafted element that the studio is synonymous with. Coal Drops is sandwiched in between the Granary Square redevelopment and Stanton Williams’ Central Saint Martins school of art (2011) on one side and the Wilkinson Eyre designed Gasholders London residential scheme (2018) on the other, with the canal at its bottom edge. What’s more, it is accessible from all of these — and from a variety of levels, with porosity being another defining factor of the project. Approaching from the south and King’s Cross station it has linked the large flanking buildings into a unified whole. The retail itself is housed in a variety of different-sized units nestling in the arches between the brick columns of the original buildings. While these columns look solid enough, they would not have taken the weight of the new roof (from which the enclosed space floor is also suspended), but that force is instead taken up by 104 new columns hidden within the existing two buildings. The retail development, according to Argent, is meant to feel like another street of London. The developer has, however, been very careful that it doesn’t look like a typical shopping street, like one of the horrifically homogenous shopping streets that blight the length and breadth of the country. Yes, there are brands, but apart from a small handful, such as the design-led likes of Cos and Paul Smith, they won’t be ones that most people are so over familiar with. And Argent intends for it to stay that way. It learned its lesson from the redevelopment of another industrial heritage site — Birmingham’s Brindley Place, which started out in a similar way but leases ended up in the hands of the ubiquitous brands and the development’s unique identity went with it. At Coal Drops, Argent will be keeping a close control on the leases. A big ‘anchor’ tenant has been signed up for the signature enclosed space beneath the kissing roofs: it will open in 2019 as a Samsung brand experience — Samsung KX LDN, which it threatens will be the ultimate creative and digital playground. 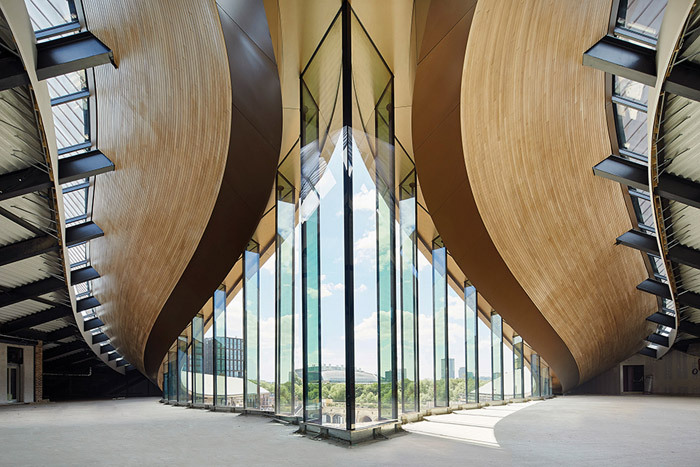 That feels somehow at odds with the calm and refined nature of what now exists thanks to the highly considered work of Heatherwick Studio.